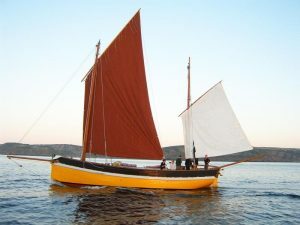 ….. SOLD – 15th APRIL 2014 …..
Lazy Lady of Leith was built by the well known and respected boat builders John Tyrell & Sons of Arklow, County Wickford, Ireland in 1952 to a tradtional canoe sterned North Sea fishing boat design. 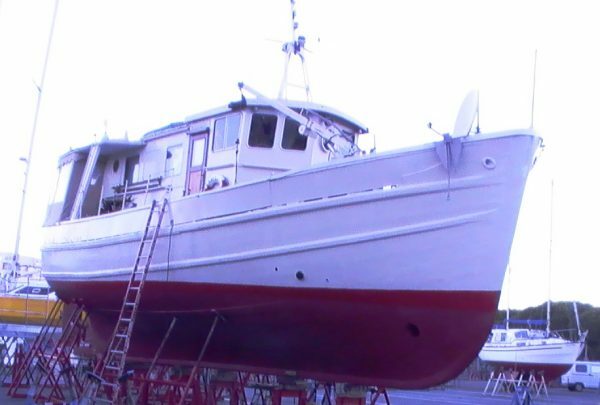 After a short period in service she was de-commissioned and professionally converted to a long-range trawler yacht. The original Kelvin engine was up-graded to a slightly larger Gardner 6LW with a National Hyraulic gearbox and hydraulic steering to include a Cetrek Autopilot. 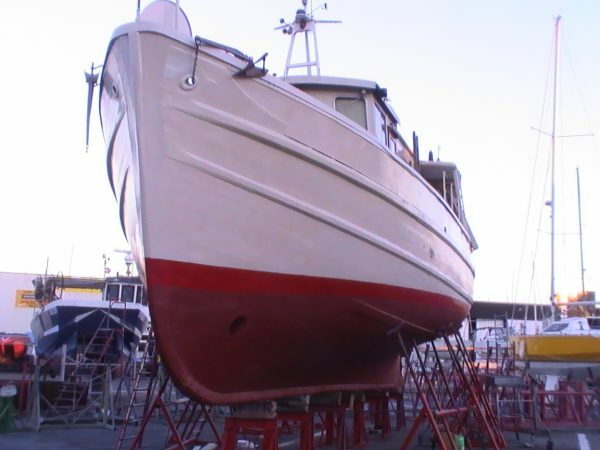 The hull and deck are of larch on oak frames and beams, the superstructure is steel framed for strength and the deck and coachroof areas are heavily over-laid with GRP resin for ease of maintainance and leak free decks. 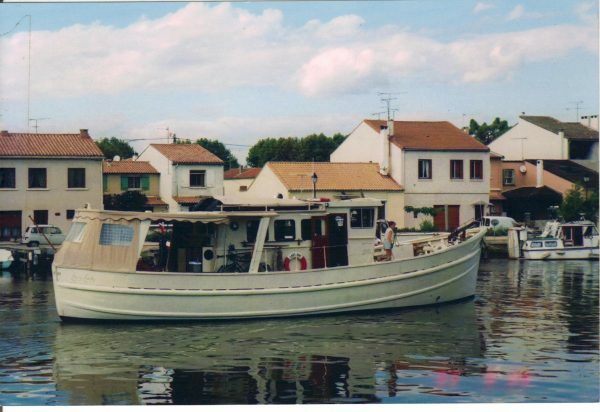 The present owner and his wife have cruised extensively in Lazy Lady which now lies on a very pleasant and economical (£26 per week) alongside mooring in the South of France within a four hour run to the sea and enjoying the micro-climate of the Languedoc ideal as a warm Winter retreat. 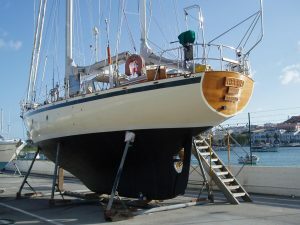 Mooring fees include electricity, water, wireless internet and parking. 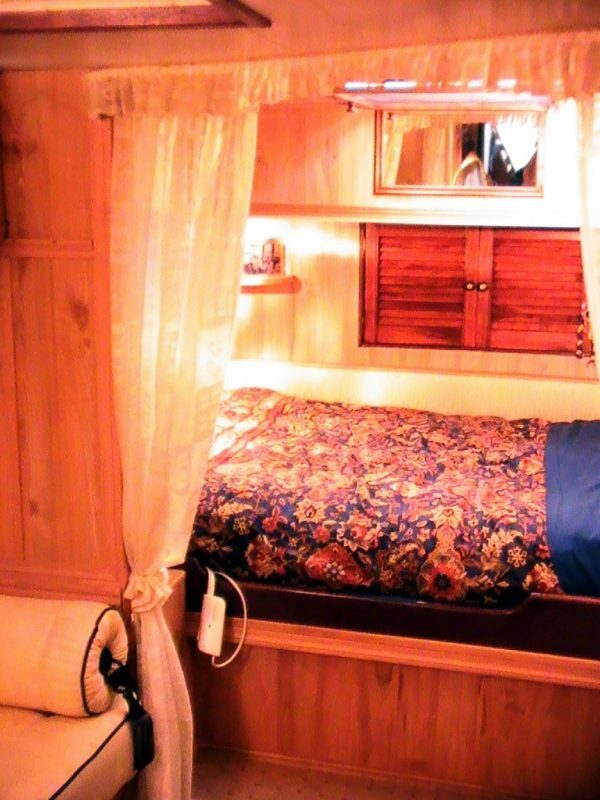 Every convenience exists on board for comfortable year-round living with oil-fired central heating. 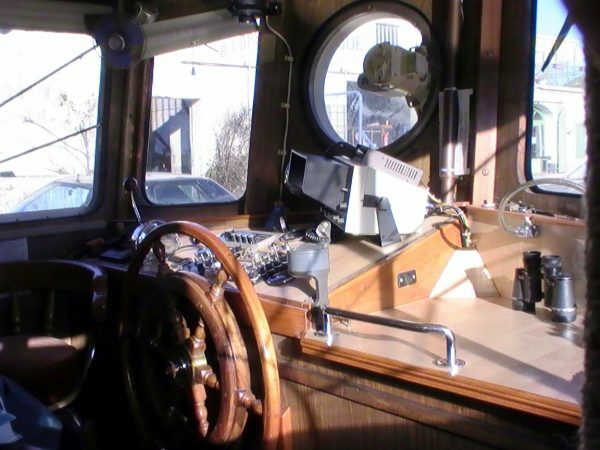 The engine room is completely separate from the accommodation and the slow revving, quiet engine with autopilot makes for peaceful stress free and relaxing cruising. Substantial steel-framed structure with cavity insulation of roof and sides. Secondary glazed tinted windows. Port and starboard side deck doors and door to aft deck area. Raised bridge deck with generous cupboards and bench seat. Helm position to port with controls and console. 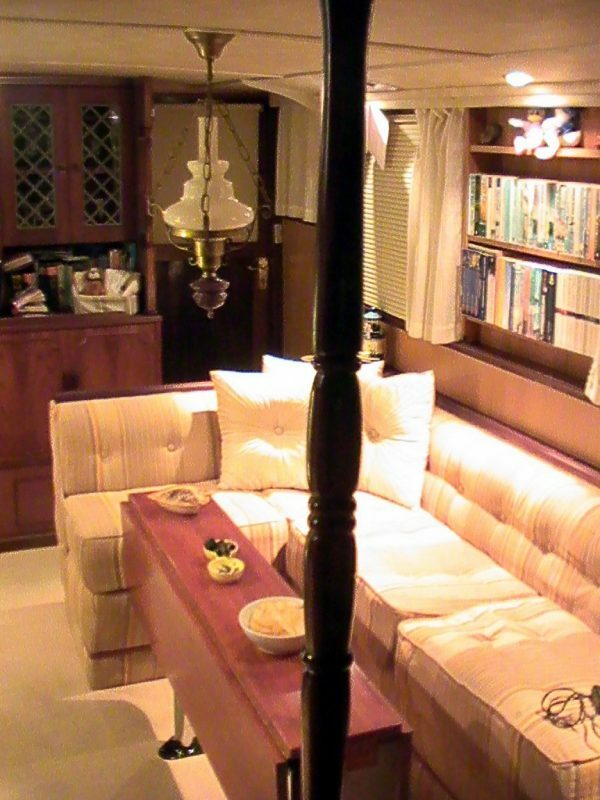 Companionway down to lower deck accommodation, TV and media stack above. L-shaped settee with folding fixed table to port with book storage above. Two small armchairs with full size Technics electronic piano/organ between. CD and audio storage above. 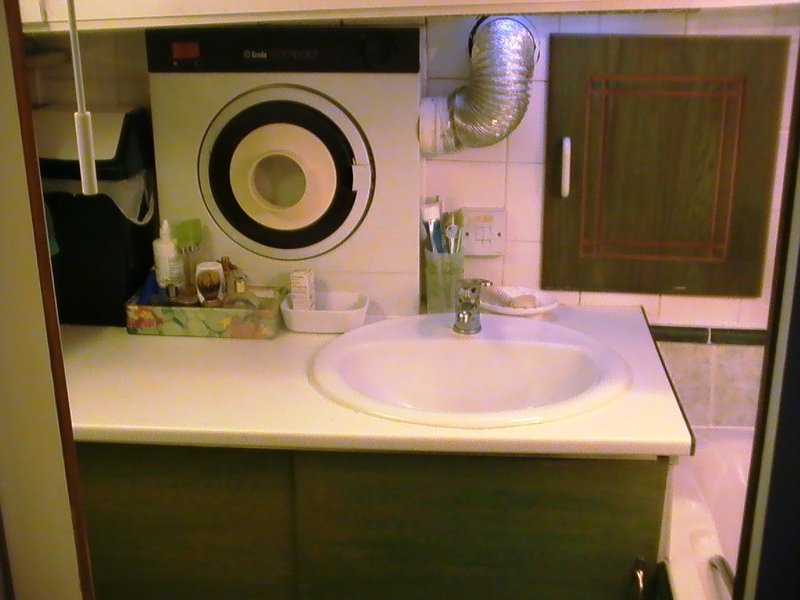 Small secondary galley across rear of saloon comprising sink, two burner hob with grill having storage beneath. Ideal as a breakfast facility or for producing hot day-time drinks and snacks without having to go below to the main galley. 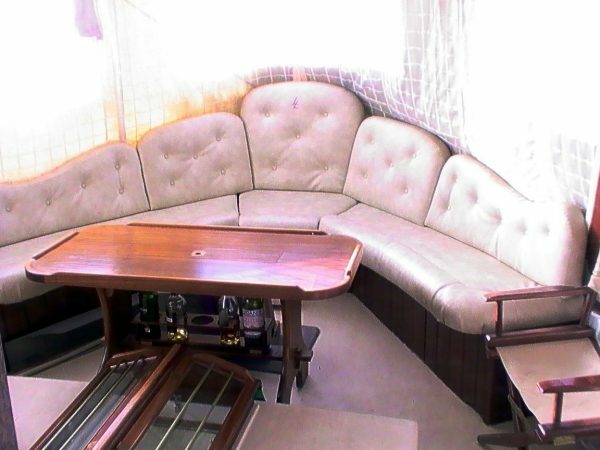 Aft door to covered entertaining deck with large fitted and upholstered stern settee with teak table having integral wine rack. Standard domestic fridge with freezer compartment in fitted unit also containing waste bin, storage, hose reel for drinking water and double 13 kilo propane gas bottle installation with auto change-over reducer. Further storage lockers, removable opening hatch to master cabin below. Fully zipped, removable screens with windows all round beneath a light-weight steel framed roof. Fitted mosquito screens and accesss beneath centre of settee to hydraulic steering components. Large open foredeck, re-enforced to take a car athwartships via removable bulwark panel. The car may be loaded via steel ramps or hydraulic crane, according to weight. Electric anchor windlass with foot control and remote from bridge. Hatch to engine room. Plough, Danforth and smaller kedge anchors. Warps and fenders storage bin. Hydraulic crane with extending jib. Twintone horns, security lighting, deck lights fitted to visor over bridge windows, Kent clearview screens. Twin Rutland 913 wind generators fitted on folding arms. 24 volt solar panel, 12 volt solar panel. Liferaft (service due) Storage for spars, ladder and 10ft. 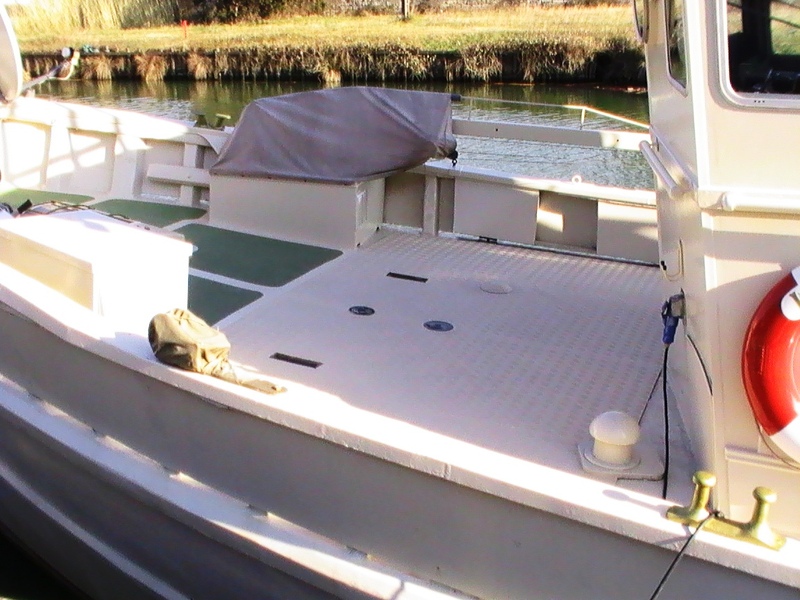 aluminium passerelle, Bombard inflatable (two outboard motors stored in engine room) Folding tripod mast carrying lights, alarm, siren, compass sender and VHF and internet aerials. 30 fathoms chain locker in forepeak with storage shelves over. Opening hatch to deck with fixed steel ladder. Port side workbench with pillar drill, storage shelves, large vice 240 volt power points. Cabinet enclosing 240 volt Honda 3kva petrol generator. Cabinet enclosing 24 volt Yanmar diesel generator, electric start. 600 litre fuel tank. 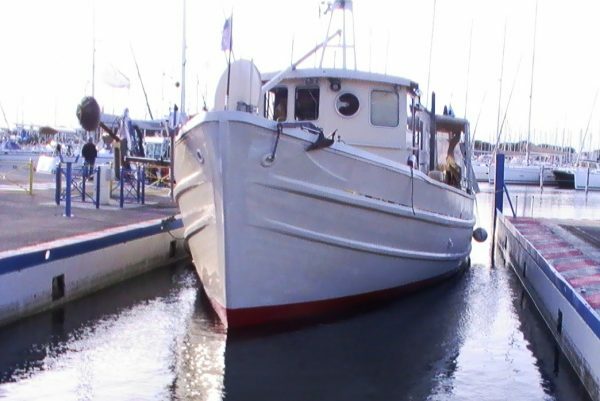 Four 110ah service batteries (new 2010) two new batteries, 24 volt bow thruster. Generators serviced in 2011. GARDNER 6LW 110hp DIESEL ENGINE with National hydraulic gearbox. Electric distribution board, wind generator and solar panel regulators, auto-pilot control and distribution box. Shore supply and RCD trip switches. Heavy duty battery charger, 12 /24 volt. Storage cabinets. Pressure balance tank for domestic water system. Remote greaser for shaft plummer block bearings. Airing Cupboard with indirect hot water tank and immersion heater, slatted linen shelving and central heating circulation pump. 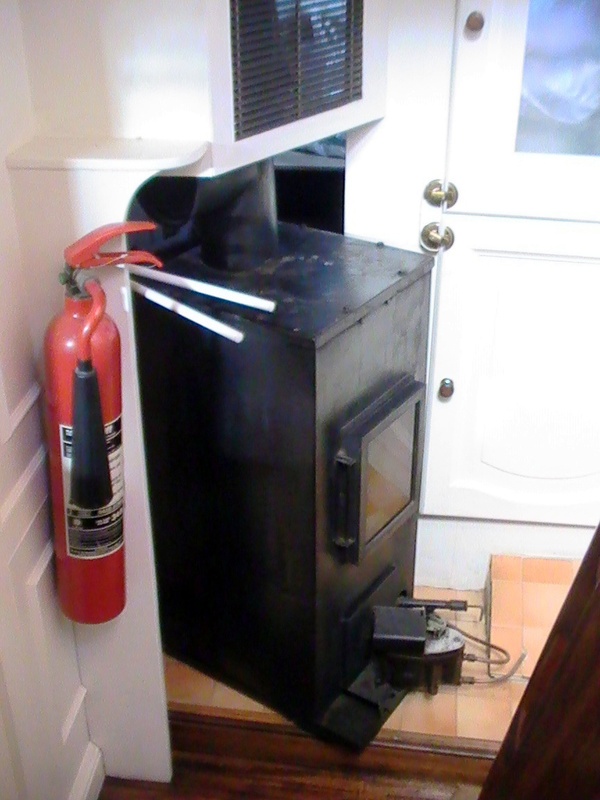 Somy drip-feed central heating boiler running five radiators and providing domestic hot water supplies. 150 gallon fresh water tank (one of two) behind passageway panelling, water pressure system pump. Bilge extractor fan running full time powered by dedicated solar charged battery. Fully tiled with bath, shower, ceramic wash basin, tumble dryer, electric WC, 240 / 24 volt lighting, extractor fan, radiator and first-aid cabinet. 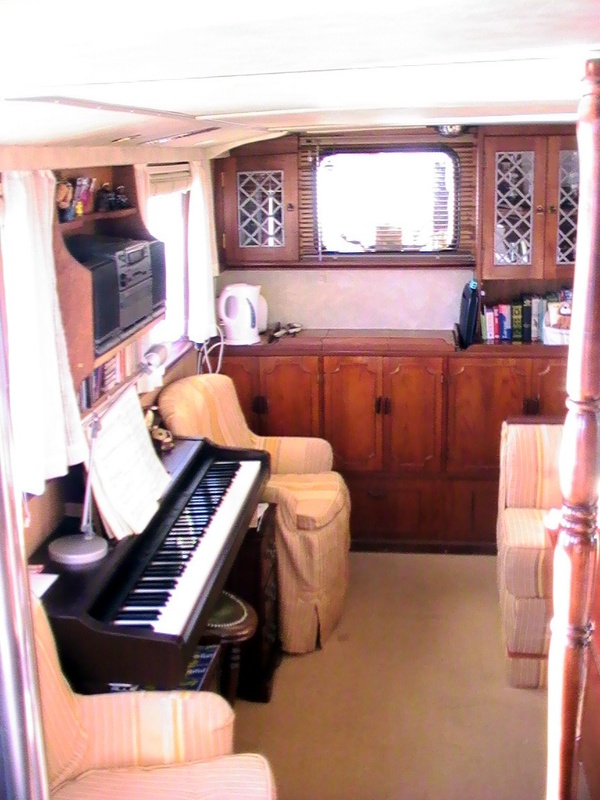 One double and two single berths (could easily be divided to two separate cabins if required) Three wardrobe units, television and video player, large book storage, two radiators, further louvred door storage area and aft deck hatch. Companionway from deck saloon to panelled passageway. 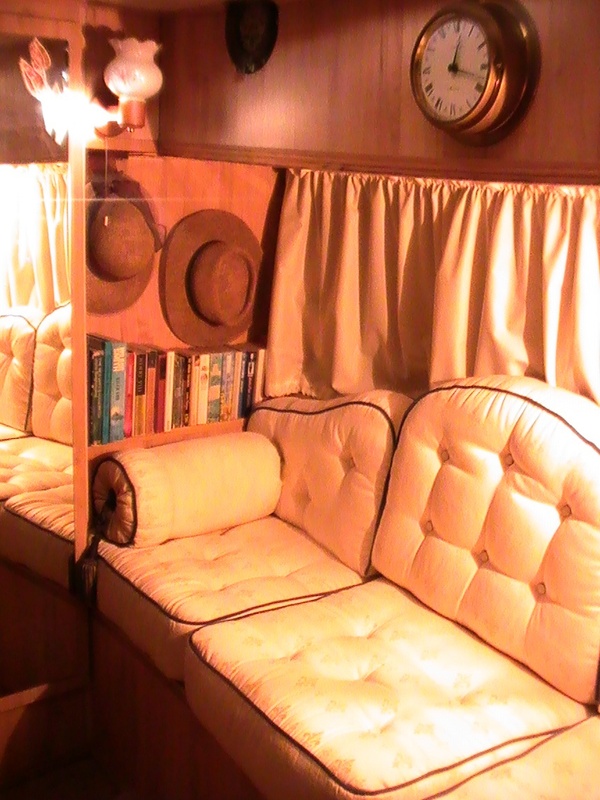 Large sofa converting to double berth, wardrobe, vanity unit with drawers and mirror. Chemical WC, full length mirror, book shelving, storage lockers, radiator and internet connection. 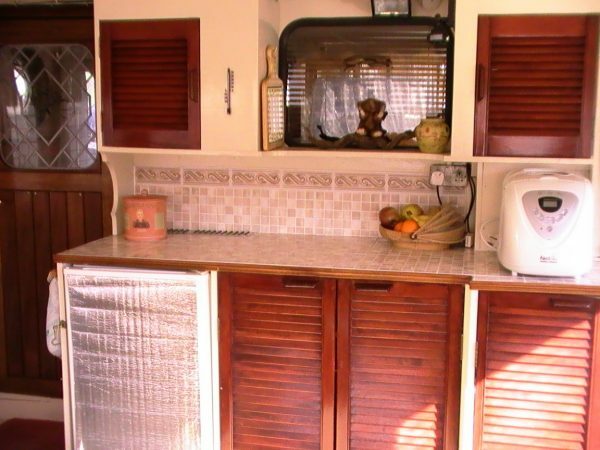 Full sized domestic gas cooker, gas water heater, extractor fan, three way fridge, pantry and crockery lockers, full sized double sink with drainer, microwave oven, 24 and 240 volt lighting and second 150 gallon fresh water tank. 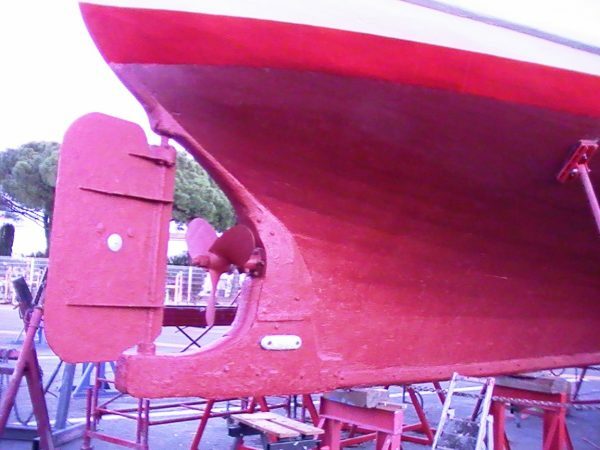 Adequate inflatable fenders and mooring lines. 2 x 3″ nylon springs with spliced eyes and rubber snubbers 25ft app. 2 x bronze halyard winches – port and starboard amidships. Steel-capped gunwhale all round fitted with wrought guardrail stanchions and wire guardrails along midships section port and starboard. 24volt deckwash outlet to foredeck. 1 x hinged passerelle – 5ft. Rigid canopy roof with drop-down zipped screens with window panels to enclose whole area. 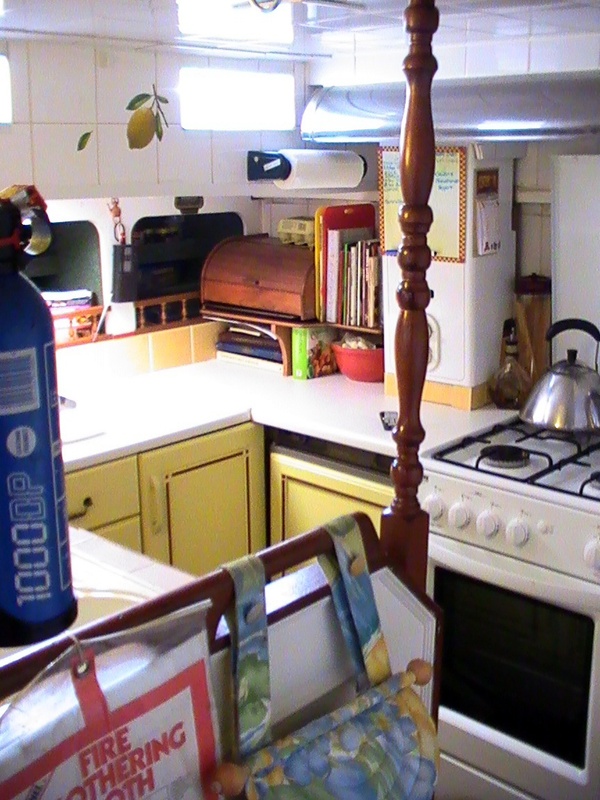 Fitted worktop to rear of deck saloon containing 240v, refrigerator, storage for 2 x 13kilo propane bottles and auto-selector. Water hose reel 75ft, spin-drier. 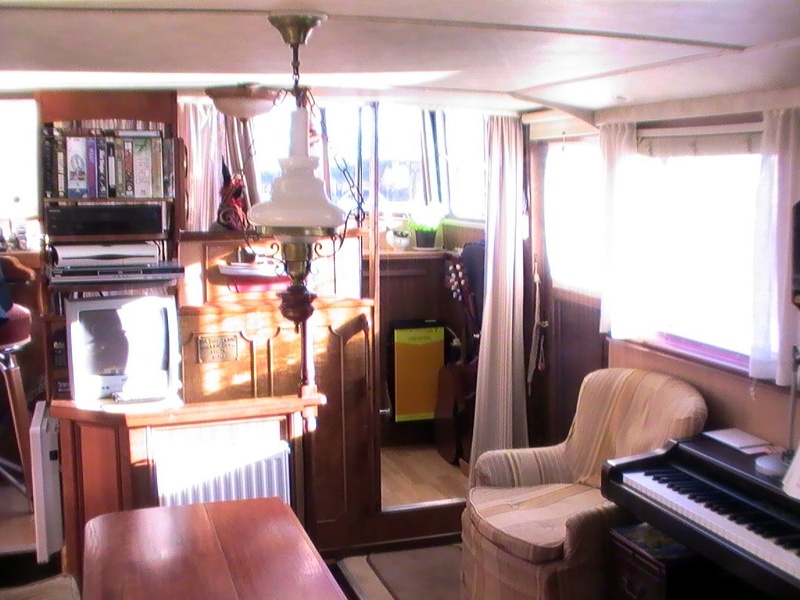 Sideboard unit containing secondary breakfast galley with sink and 2-burner stove and grill, crockery and storage cupboards etc, electric kettle and toaster. Glass cabinet above. Roller blinds , venetian blinds and curtains all round. 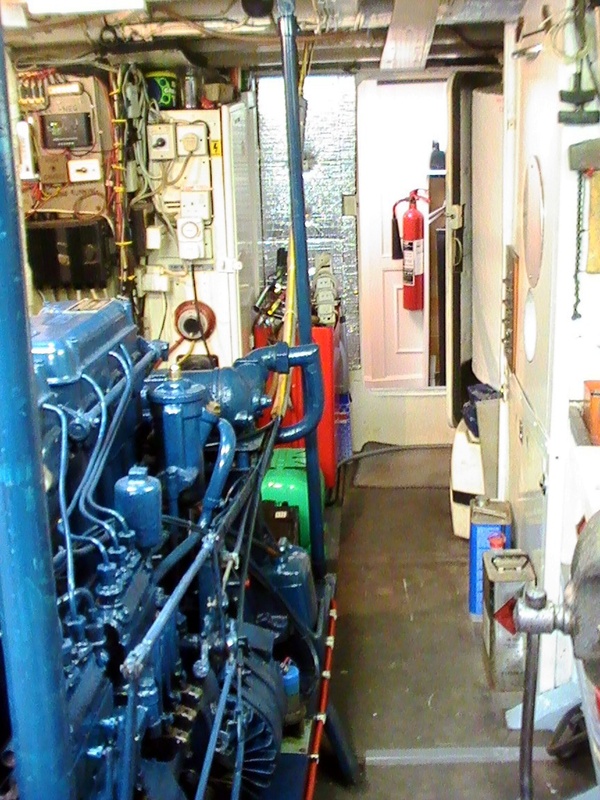 “SOMY” central heating boiler – drip-feed diesel flued up through deck saloon. 8kwatt serving 5 radiators and domestic hot water tank. 1 x double berth folding to settee, book storage above, hanging locker, vanity unit with drawer storage full length and vanity mirrors. Radiator. Large storage compartment for luggage etc aft of master cabin- access through doors in bulkhead. 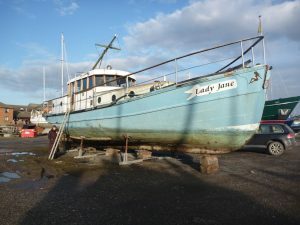 Lazy Lady of Leith is undoubtedly a superbly fitted and well equipped ‘Little Ship’ in long and experienced ownership. 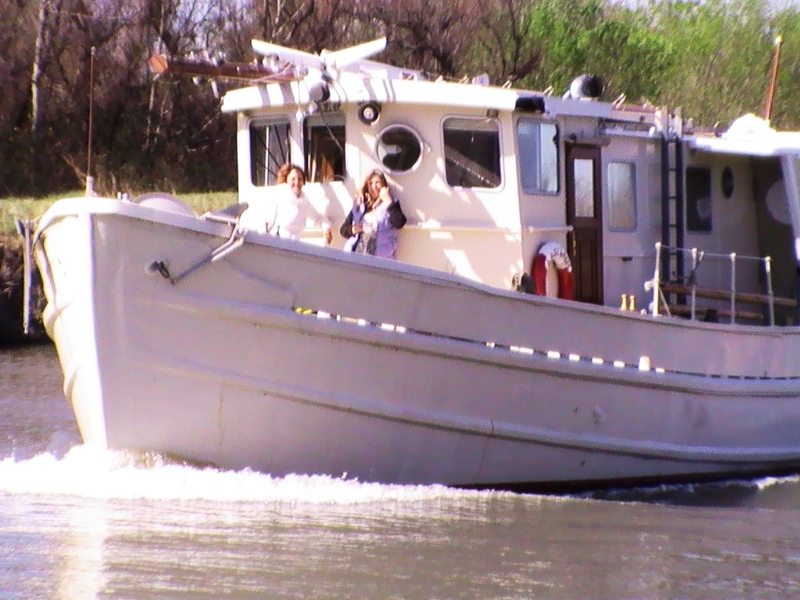 An ideal vessel for extended living aboard or cruising adventures in the Deny Val Baker style. 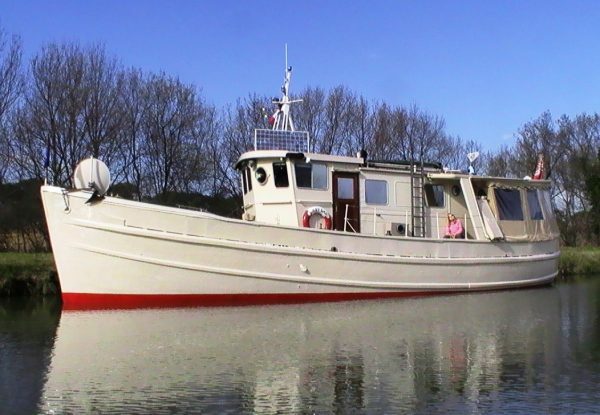 The quiet and convenient South of France mooring is included in the sale with water, electricity, wifi and sanitaires until 2015 with third party insurance also included. In total less than £30 per week. February 2014 haul-out, full exterior hull inspection and re-paint. Anode replacement.